Sat., April 29, 2017, 6 a.m.
NEW YORK — If you build it, they will stay. 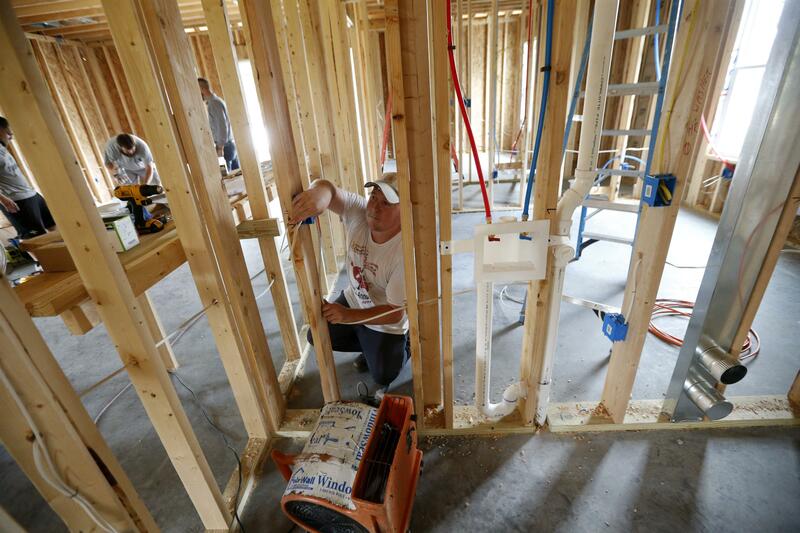 The small businesses that dominate the home remodeling industry are expecting robust growth in the next few years, thanks partly to baby boomers who want to remain in their homes. Home remodelers say they’ve had a pickup in projects from boomers who are in or approaching retirement and are seeking to modify their houses. It’s a trend known as “aging in place,” an alternative to moving to smaller quarters or a warmer climate. Many of these homeowners are hoping to make their surroundings easier to manage and safer in case they have health problems. They’re replacing bathtubs with walk-in showers, installing safety rails, widening doorways and building ramps — features known as “universal design” since they can be used by anyone, regardless of physical ability. Boomers are also redoing their kitchens and sprucing up other areas — since they’re staying put, they want to enjoy their surroundings. Zach Tyson estimates that 30 to 40 percent of his revenue is now coming from boomer renovations, up from 15 to 20 percent five years ago. Most of the projects come from homeowners who are healthy and mobile now, but want to be prepared if illness or injury hits. Besides making bathrooms safer, they’re enlarging rooms so wheelchairs or walkers can be used more easily, and also to give the rooms a more open feel. “It’s trending up, for sure,” says Tyson, co-owner of Tyson Construction in Destrehan, Louisiana. The oldest of the 76.4 million boomers, the U.S. generation born after World War II, are turning 71 this year. As more of them retire and make decisions about where they want to live, there will be a great need for accessible housing, according to a report released in February by Harvard University’s Joint Center for Housing Studies. “A large share of these households live in older homes in the Northeast and Midwest, where the housing stocks have few if any universal design features,” the study said. The report predicts home improvement spending by homeowners 65 and older will account for nearly a third of the total amount of remodeling dollars by 2025, more than twice the portion that group spent in 1995-2005. Owners age 55 and over already account for just over half of all home improvement spending. “The boomer activity seems to be driving the market,” says Abbe Will, a research analyst at the Harvard center. That’s a change from the past, when older homeowners generally handled maintenance, repairs and landscaping but tended not to renovate. And some of the boomer-driven remodeling is coming from younger homeowners who expect their parents might later come to live with them and want to be ready, Tyson says. The requests Tiffany and Bryan Peters get from boomer customers include replacing traditional turning doorknobs with lever handles that can be pushed down. Homeowners want motion-sensor light switches and faucets, and non-slip flooring. In bathrooms, they’re replacing fixtures with models that are designed for people with disabilities — showers than can accommodate wheelchairs, and toilets at the same height as wheelchairs, Tiffany Peters says. Home remodeling companies began seeing an increase in boomer spending about 18 months ago and expect it to contribute to their growth in the next few years, says Fred Ulreich, CEO of the National Association of the Remodeling Industry, a trade group. “We see this as something that is dramatically affecting the marketplace,” Ulreich says. Boomers typically live in homes that are several decades old, prime targets for remodeling, Ulreich says. Unless they move to a brand-new home that’s designed for aging in place, their decision is likely to mean remodeling. Sal Ferro says boomers are his biggest group of customers, but he’s not getting many requests for aging-in-place projects. It’s more renovations to make their homes more enjoyable. “They’re finally getting the projects done that they always wanted. They’re getting that kitchen or bathroom,” says Ferro, owner of Alure Home Improvements, based in East Meadow, New York. Some remodeling companies are specifically marketing to boomers, sending salespeople to trade expos and events those customers are likely to attend. Miracle Method, a franchise business that refinishes kitchens and bathrooms, has increased its outreach to boomers, says Erin Gilliam, the company’s marketing manager. Franchise owners say much of the 11 percent growth in the franchise’s overall business in the past year was driven by boomers, she says. Gilliam’s husband, Gabriel, sees the trend in the franchise he owns in Salt Lake City. He estimates that revenue from boomers has risen between 10 and 20 percent, and the growth is prompting him to hire more workers. He has five staffers now, having added one per month the past three months, and expects to reach 10 in the next year. “I’m hiring as quickly as I can,” he says. Published: April 29, 2017, 6 a.m.